Kitchen backsplashes are normally vertical coverings that are attached to walls rising above countertops, sinks, stoves, or other work surfaces to protect the walls from spills and other happenings. Therefore, the primary purposes of a kitchen backsplash are to protect the wall and simplify the clean-up process, but this new addition can also liven up, brighten up an existing kitchen and decorate it. Functionality of kitchen backsplashes is as important for many homeowners as its beauty. Especially for homeowners who want to create an Old Italian style kitchen. Kitchen backsplashes can be made of almost any materials, such as granite, marble, corian, wood, stainless steel, metal, glass, etc... Backsplashes material options are available in a wide array of colors and styles. Just as kitchen backsplash material options vary greatly, so do their prices. Therefore, the price of your kitchen backsplash project normally will depend on the material you choose and cost of installation. 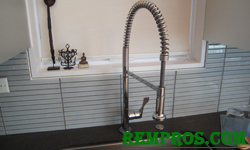 Labor cost for the backsplash installation depends on complexity of the job. In addition, kitchen backsplashes are available in traditional styles that can be created with kitchen backsplash materials that have an old world feel, such as tumbled marble or mosaic tiles. In contrast, kitchen backsplashes can be in contemporary styles which have materials that are sleek and/or non-complex, such as metal tiles or stainless steel. Contemporary style kitchen backsplashes gaining more and more popularity lately mainly because of their fairly easy installation process. Ceramic and porcelain tile is relatively the easiest kitchen backsplash option for a do-it-yourself project. In addition, these backsplashes can be relatively easy to install and can suit to nearly any kitchen style and décor. Ceramic tile is one of the most versatile options of kitchen backsplash materials because of the variety of colors, shapes and sizes available that give homeowners an opportunity to coordinate their backsplash with kitchen cabinets or their floor to create a truly custom look. Some installers recommend homeowners to consider keeping design simple by choosing the same tile for your kitchen backsplash as they’ve chosen for the floor. Other options of kitchen backsplashes materials are normally more expensive and harder to do it as a do-it-yourself project. For example, glass tile is a very good kitchen backsplash option especially if you have many lights in your kitchen. The reflection of the light can bring to your kitchen décor a very nice and luxurious look. Glass tile is non-porous, so you don’t have to worry about mold, mildew or staining. In addition, glass tile can be textured, frosted, back-painted, colored glass, etc... So, there are lots of glass tile backsplash options to choose from and alternating these tile in your own way can give your kitchen an even more unique and custom look. Natural stone can be an ideal option if homeowners want to make a kitchen backsplash with the same material as kitchen countertop. Backsplash of the same material offers an opportunity to give the room a neat and nice appearance. 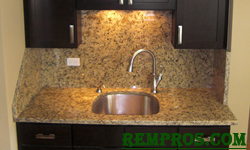 Granite and marble can be examples of natural stone kitchen backsplashes. They offer about as much versatility as ceramic tiles and are considered to be an elegant option. They are both easy to keep clean and will look new for many years. Stainless steel backsplashes are a good extension of stainless steel countertops the same way as it works for granite option of kitchen backsplashes. Stainless steel material is not only eco-friendly, but because of their non-porous surfaces they are also one of the most sanitary backsplash options you can have in your kitchen. It’s crack resistant, waterproof and easy to clean.